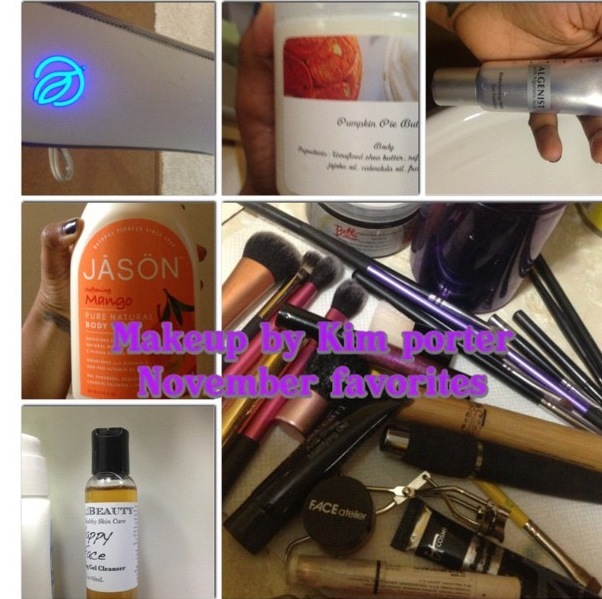 Here are my November favorites in beauty and skincare. It’s a lot, visually, so if I miss anything just refer to the photos. Honestly, I use a lot of items until I either get tired of them, or they run out; therefore, you might see a repeat of products from last months post. I purchased the Jason Shower Gel on whim from my local health food store. I love it. My skin is never left feeling stripped, but, soft and moisturized. It doesn’t foam up as much as I’d like but, that isn’t a big deal. It has a mild fruity scent, that doesn’t linger too long, so it’s not annoying, and doesn’t interfere with a perfume or spray you might use. Belle Butters Unyevu Butter and Pumpkin Pie Butter. I love both of these. I use the Pumpkin Pie Butter mostly on myself right after the shower to lock in moisture. The scent is just divine (check my review). The Unyevu butter I use on my daughter’s hair and on my hands. I think my husband sneaks and uses it, too! I’ve been using the Tria Beauty Skin Perfecting Blue Light Treatment for about 3 months now. I really suggest you try it out if you’re an acne sufferer. It helps. The Algenist Triple Action Micropolish and Peel is something I’ve had to put down my Clarisonic MIA for. I learned the hard way that I can’t use both. I’ve used the Algenist Triple Action Micropolish and Peel twice per week for a little over a month, and my skin looks healthier, and brighter. My skin is also as soft as a baby’s bottom. Cerave Skin AM & PM Moisturizer I use these religiously, even after switching out the Cerave cleanser to use my Sugared Beauty Happy Face Cleanser. Cozette Brush Vessel. I use this to store my brushes and to keep my clean and dirty brushes separate. What were your November Favorites? I use the Cerave PM an dAM Mositurizers. I think I like just as much as the embryollise (sp?). For the new year i am going to invest in brushes! Can you show us where you keep your brushes and how you clean them? You probably did this already lol but just curious. I use baby shampoo lol I saw a blogger do that once. I've been keeping mine in old jar containers for now but the more I get the more room I need to put them. Sure! Would you prefer a pictorial or video? You can use baby shampoo. Sam Fine uses Dawn. I'm going to do a post on how to make your own brush cleaner. For storage, I have the cozette brush vessells. I have to keep mine in a covered container if I have them out or else the little one will get to them. There are creative ways you can make your own though… I was just telling someone about buying different glass vases and using glass pebbles or something at the bottom to hold the brushes when you stick them in.